Exhibition, "Water Tokyo Seen from Outer Moat-For Historical and Ecological Corridor"
The following symposium was held by Laboratory of Regional Design with Ecology. Symposium: "Exhibition of Water Tokyo Seen from Outer Moat-For Historical/Ecological Corridor"
Place ： Sky Hall, 26F, Boissonade Tower, Ichigaya Campus, Hosei Univ. "Local Practices and Future Perspectives": Koto, Chiyoda, Sotobori, Nogawa, Hino, etc. "Proposals for Regeneration" (Regeneration of City Core: Nihonbashi River, Oceanfront Regeneration: Shinagawa, and Suburban Regeneration: Hino). Apr.29,2008 The following report was issued. "Formation and Regeneration of South Italian Ocean Cities-Gallipoli and Monopoli-"
"Making -Sotobori Meisho Zue- (Outer Mort Sight Maps) -A Letter From Sotobori-"
"The Basic Direction for Regeneration of Water Town Hino and Irrigation Channels"
： The research results of 2007 and proposal of grand design on regeneration of irrigation channels in Hino will be reported by Laboratory of Regional Design with Ecology, Hosei University. The discussions with citizens and officers will be anticipated. In the panel discussion, concrete process for future regeneration of waterfront in Hino City, and feasible proposals will be discussed. Jul.01,2008 The following report was issued. "Community Planning Forum Utilizing History and Nature for Future"
： How livings and landscapes in Kunitachi City have been changed throughout the history since it was called as Yaho Village? What did citizens got and lost? We will provide the place for citizens to revaluate the city-s history, nature and agriculture, and to examine community planning for the future. Yaho is located in the southern area of the city and is facing the issues such as expansion of housing areas, succession of history and culture, and so on. We will examine influences on children, and green conservation and restoration in Bunkyo and Fujimidai districts from the viewpoint of urban environment. Organizer ： Executive Committee of "Community Planning Forum Utilizing History and Nature for Future"
The following report was issued.
" International Design Workshop / Re-Design of the Landscape of the North Shinagawa District"
Theme ： "Conservation and Creation of Local Resources-What is -Creating Landscapes-"
Theme ： "The Relationship between Groundwater under Hino Tableland and Asa-kawa(river)"
Prof. Yamada of Hosei University gave a lecture on the origin of groundwater of Hino Tableland through the Asakawa, Tamagawa, and rainwater. We discussed how to conserve and regenerate spring water. The researches on groundwater have been concentrated on Musashino Tableland. Mr. Tsunoda has been involved in various researches on groundwater. Few researchers tackle with groundwater of Hino Tableland. Hino city is one of such autonomous bodies which have continued to research groundwater. However, the results have not been stored enough when compared with Mosashino area. Mr. Tsunoda is the only person who has conducted researches on whole Hino Tableland area. This is unpublished study which is financed by The Tokyu Foundation for Better Environment. Our team uses his data as a base. We hope you will participate in the seminar.
" Picture Record: Kokubunji Cliff with Rich Water, Green and Livings-For Regeneration of Value Resources in Musashino"
" Manazuru-Discovery of Charms of Port Town and Future Perspectives"
" New Ways to Live in Rural Areas-Case Study of Hino in the Suburban Areas of Tokyo"
Laboratory of Regional Design with Ecology, Hosei University + Toshin Management Institute, Toshin Jyuken Co., Ltd.
-Shimanto Hata Areas, Kochi Prefecture- (Symposium Report of 9 Feb. 2008)"
We started to publish our reports in Hosei University Repository. You can read them in the web. The following link icon will be attached to the reports published in the repository. The summery of Basin Zone Regeneration Project, Hino Irrigation Channel Regeneration WG (24 July, 2008) was updated. The following reports were updated on the Hosei University Repository. 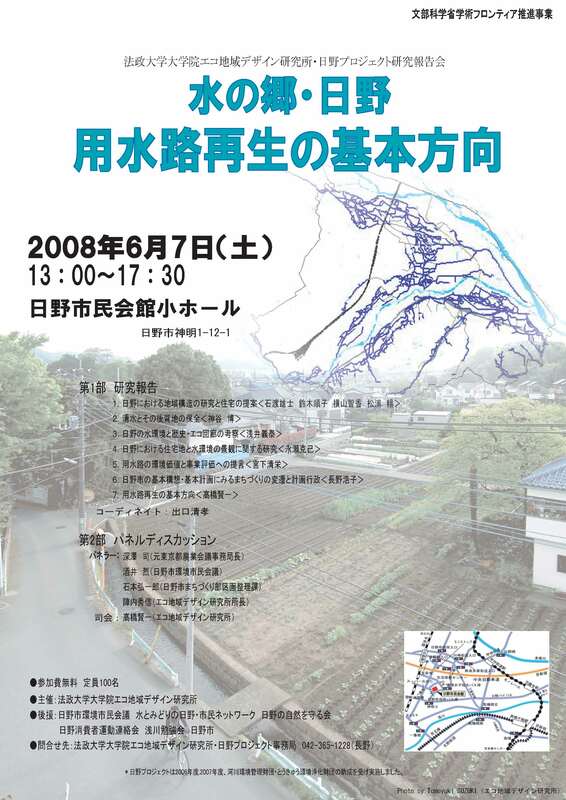 "Picture Record: Kokubunji Cliff with Rich Water, Green and Livings—For Regeneration of Value Resources in Musashino"
"Manazuru—Discovery of Charms of Port Town and Future Perspectives"
The Debrief Session by Laboratory of Regional Design with Ecology (2008) was held.
" Project Report on Vitalization Proposal for Waterfront and Surrounding Areas of Kamejimagawa and City Core"
" The Guidelines for Landscape Evaluation and Urban Area Improvement of Surrounding Areas of Outer Moat"
" Spatial Improvement Plan and its Realization Measures for Historic Outer Moat around Edo Castle"
" New Measures for General Control and Use Plan of Coastal (Waterfront) Areas"
" The Landscape based on Water Environment: Historical and Ecological Corridor in Irrigation Channels of Hino/Small River Basins of Machida"
" The Possible Bottom-up Urban Development based on Participation of Citizens"
" The General Overview by Shimanto River Basin and Hata Kuroshio Area Regeneration Working Group"
"The Spatial Formation and Transformation of Japanese Port Towns from the Viewpoint of Typology"
" Five Years' Achievements and Future Issues of Port Town Regeneration Project"
" A Vacation City with Wealth of Life: Otranto in South Italy"
" Urban Structure in Waterfront Regeneration of Seoul"
" Temperature Distribution and Local Circulation in Waterfront Cities"
" Proposal and Formulation of Historical and Ecological Corridor with the Axis of Water System"
" The Laboratory of Regional Design with Ecology Seen in Maps"
The following research meeting will be held. The students will hold a debrief session on their field researches of Hino. We are waiting for your participation. 3) What is the Purpose of Gakko (楽校) of Waterfront? 5) What Can We Do for Conservation of Irrigation Channels?
" Exhibition of Water Tokyo Seen from Outer Moat-For Historical/Ecological Corridor"
Hino City and Hosei University concluded a project cooperation agreement. The Laboratory of Regional Design with Ecology has developed research study on Hino in cooperation with citizens and the government of Hino City. Based on the efforts and research results, Hino City and Hosei University concluded the project cooperation agreement on 27 February, 2009. In the 21st year of Heisei (2009), we will launch a three years' joint project for regeneration of water city Hino by public-private-academic sectors.